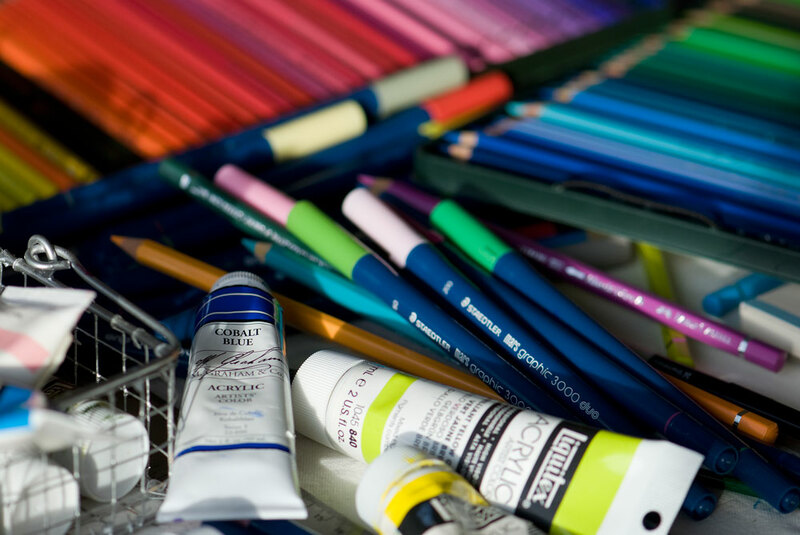 Somewhere in a forgotten back corner of a closet, the Danbos unearthed my crusty old paints and art brushes. They blew off the dust and carted all the art supplies out to a warm and cozy corner of our abode which is always flooded with natural light. They called it their “studio” and they stayed there from morning ’till night for days, working on their art and talking and laughing quietly together. Where they got their mini-easels and canvases, I’m not sure—I suspect it may have been from the art supply shop down the block. Sometimes I’m beside myself with curiosity about those two—I should ask the art shop proprietor if two very short box-headed fellows happened to come by for any art supplies recently. 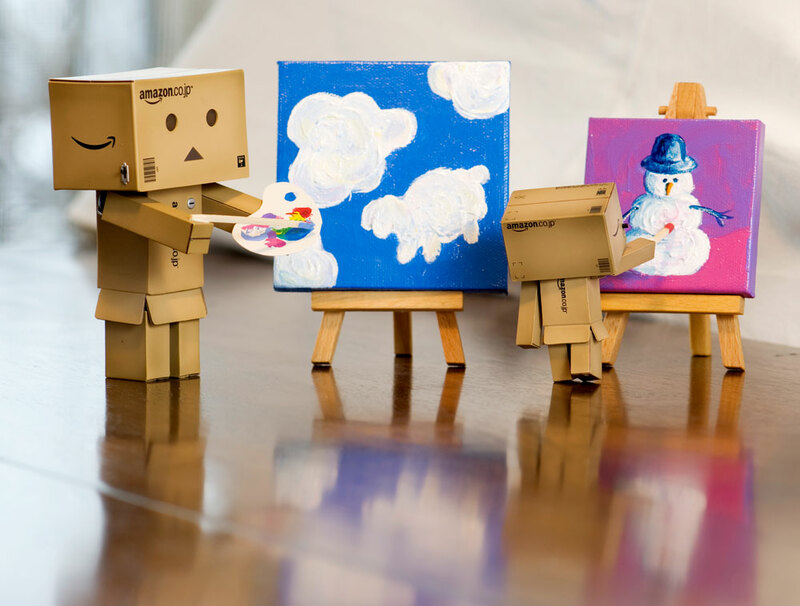 The Danbo Brothers discover some old art supplies. It may be fortuitous that the Danbos have been confined to the indoors until such time as proper winter wear can be found—were it not for this confinement, the brothers might never have discovered their Inner Artist. And I have to say, I believe that these two may indeed have some latent artistic talent. They tell me that they have never before picked up a paint brush or played with paint, but you would never know it looking at their work. Although they both love bold colours, they clearly have their own unique styles. Big Danbo seems to go for simpler, larger forms, whereas Little Danbo has a penchant for more detailed work. One thing is certain: they are having a lot of fun! while the art tells you to take your time. The Danbo Brothers are quietly confident and not at all self-conscious or shy. 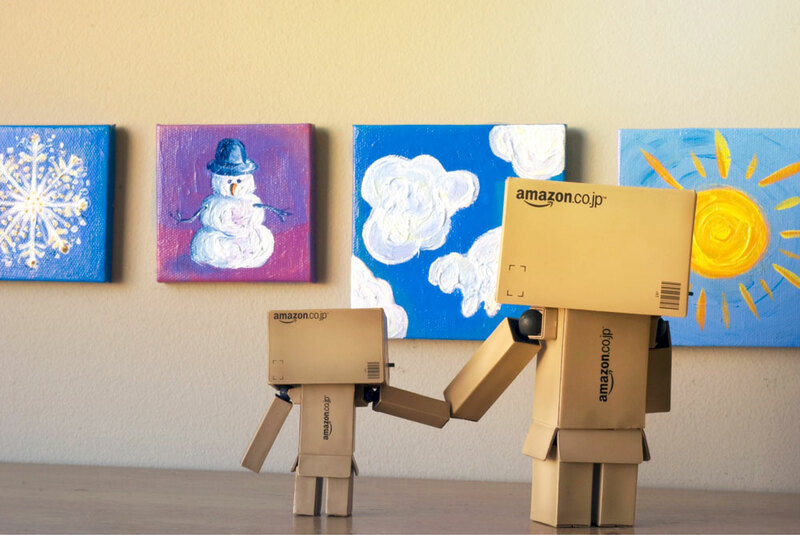 When they finished up their first series of paintings, which they called “The Danbo Brothers’ Winter Collection”, they decided that it deserved a wider audience. Unbeknownst to me, they showed their work to a local art dealer and gallery owner, who was instantly charmed by both them and their work and decided to feature their Winter Collection in an art show entitled “Unusual Artists”. The Danbo Brothers thought the title odd, as they don’t consider themselves unusual in any way, but they were nevertheless delighted to be offered their first show. The local newspaper picked up the story, which created a bit of a buzz, and their first show was very well received. And all this because they had to stay indoors for lack of proper winter hats and scarves and simply chose to make the best of it! It may be cold and snowy outside, but in here the sun always shines bright when the Danbo Brothers are around. The Danbo Brothers enjoying their first show at a local art gallery. To find out who the Danbo Brothers are and how they came into my life, check out my previous post: Meet the Danbo Brothers. Hello Jeannie, It is a magnificent collection for the Danbo Brothers. Oh my gosh…they are SO creative. Love their paintings!!! 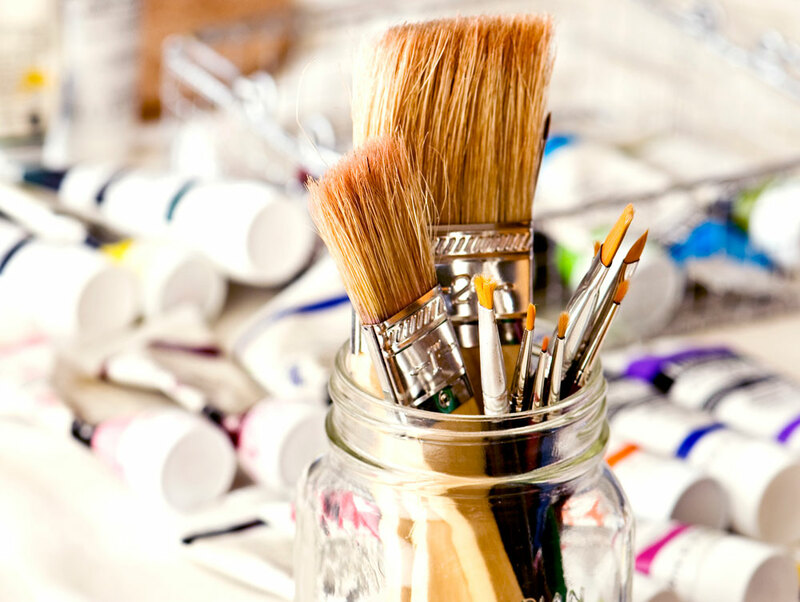 And you are pretty creative yourself ;) ;) Love this post! I’m a little late to the conversation and everything has already been said, but let me add my “Wow” anyway :) I never cease to be absolutely amazed by the Danbo Bros’ (your) enthusiasm to try something new, and not only just ‘try’ it, but be absolutely amazing at it! Bravo, Danbo Brothers and Brava Jeannie! You made me smile, again !!! 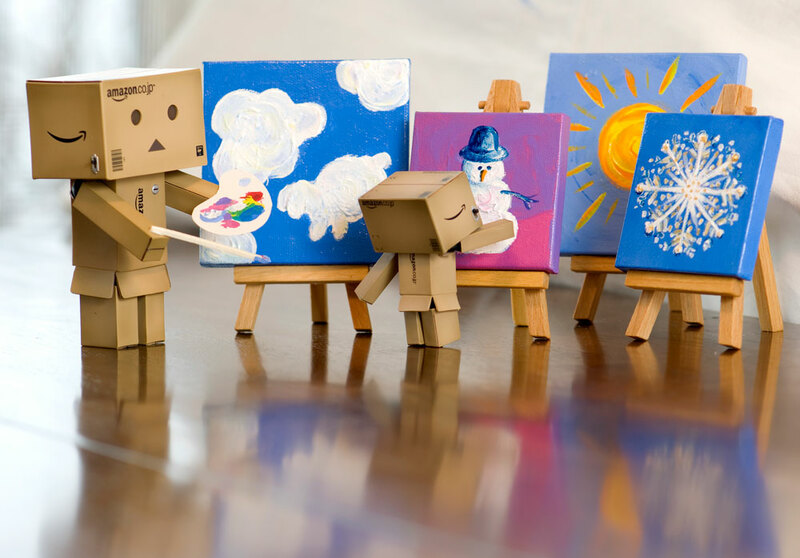 Great artists those Danbo Brothers.!!! ;-)) hope the weather get a little warmer for you in AB.Here rain is back ( light rain to melt the snow that fall last Friday night). What a great post ~ clever, and most of all the creativity of the writing/story and especially the great paintings and photography (love the second photo ~ to me seems almost spiritual to a painter). This is a great post to wake up and enjoy the morning with. Cheers! You know Jeannie, I had never even heard of the Danbo brothers until Flickr. Oh Cute! And very delightful paintings!